A Normal Size, Rare, Visibly Aged, Well Made Jordan Point That Exhibits Surface Sheen And Stone Coloration Patination, Aging In The Corner Notches, Correct Rolled Basal Stem Edge Hafting Dulling, Aged Surface Deposits, Correct Style Blade Flaking, Correct Material And Manufacture For The Area Found. Found By Perry Lynn Cude Sr. Ex-Perry Lynn Cude Sr. And R.W. "Dub" Lyerly Collections. 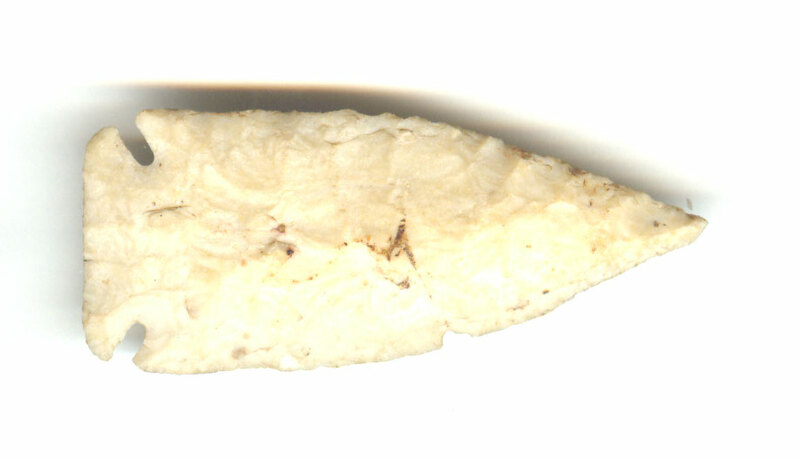 This Type Is Most Often Found In Southwest Indiana And As Far South As Northern Arkansas, Listed In Selected Preforms, Points And Knives Of The North American Indians, Volume III, By Gregory Perino On Page 126. Includes A Ken Partain Certificate Of Authenticity.